The former Military Hut at 89 Lerderderg Street, Bacchus Marsh. The former Military Hut at 89 Lerderderg Street, Bacchus Marsh is of local historical and aesthetic significance to the Shire of Moorabool. 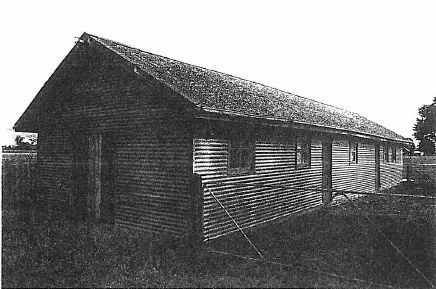 The former Military Hut at 89 Lerderderg Street, Bacchus Marsh is of historical significance for its associations with, and as a remnant building from, the former Military Camp at Darley. This building has local significance in demonstrating the effect of government action and international engagement in the Second World War. The former Military Hut at 89 Lerderderg Street, Bacchus Marsh is of aesthetic significance as a particularly intact World War Two iron clad military hut, possibly an officers' mess from the Darley Military Camp, erected in 1940 and relocated in 1945. Key original features of the building include the overall form and scale, corrugated metal sheet cladding, front double timber doors, and evenly spaced timber framed awning windows to the side elevations. Corrugated iron, gable roofed shed, erected with the gable facing the road. The roof appears to be clad in asbestos cement. It bears a painted timber sign on one door: "AMF Officers". There are (now) vehicular timber doors in the gableend, and five four-paned small windows and two doors in the right hand side. The cladding is fixed horizontally. There are two small "Sunshine" vehicular metal gates and an old flat top picket fence (unpainted) with rails and split posts. PREVIOUS USE: Military officers' mess"? CONDITIONS & THREATS: Fair. Roofplumbing needs repair. Downpipes do not appear to be longer than 300mm and so discharge down the walls. Spouting is damaged and corroding.